Very clean color-neutral motherboard! 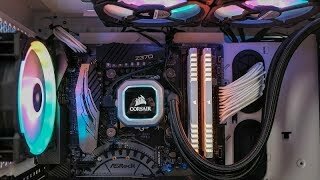 I have been using ASRock for all my computer builds and have never had a problem. Amazing overclocking potential! Also space for 3 M.2 drives a plus. Board is wonderful. 3 X M.2 slots is great for cable management and simplistic approach to storage. Everything bios and lighting wise is pretty straight forward. Crazy easy BIOS. Recognized my flash drive had the operating system and did all the work for me. Looking forward to overclocking. Would definitely recommend.